This article continues from Part I. Part II chronicles the decline of Huntley & Palmer. George Palmer (1818 – 1897), the driving force behind the firm, died in 1897 and the following year Huntley & Palmer was registered as a private limited company. The company had 4,000 employees in 1899. Huntley & Palmer was the 38th largest British industrial company in 1905, with a capital of £2.4 million (c. £255 million in 2014). It had 6,500 employees. Iced gems were introduced in 1910. As late as 1910, Huntley & Palmer largely eschewed advertising. Huntley & Palmer had a regular staff of 7,000 by 1911, plus additional staff during peak times. That year the company was accused of dismissing without notice workers who were affiliated with trade unions, although company officials denied the accusation. By 1914 almost half of production was exported, 50 percent of which was destined for the Far East and Africa. 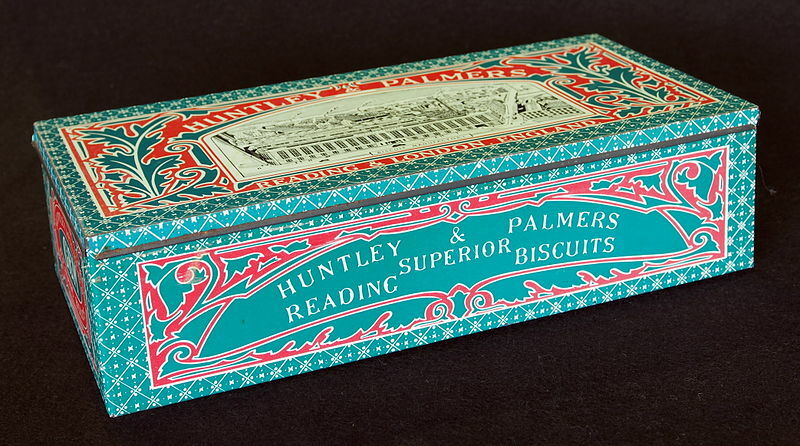 The company supplied the British army with hard tack biscuits during the First World War. The export trade was slow to rebuild after the First World War; in 1924 only 25 percent of output was exported. Meanwhile, domestic sales declined as H&P failed to introduce new products or update existing ones. Marketing was poor, with inadequate advertising, fewer salesman than other firms and no depots outside Reading. 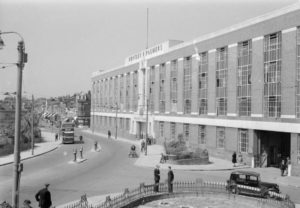 It has been argued that Huntley & Palmer had too many product lines to produce efficiently, and that the Palmer family paid themselves overly generous dividends and salaries, funds which might otherwise have been reinvested into the business. By 1920 Huntley & Palmer operated 24 acres of factories across 36 acres of floorspace. 90 percent of the thousands of tons of flour used annually was grown and milled in the area around Reading. The Osborne (similar to a digestive) was their most popular biscuit, followed by the Marie (rich tea) and the Ginger Nut. High income tax and death duties persuaded H&P to merge with Peek Frean of Bermondsey, under a holding company called Associated Biscuit Manufacturers, in 1921. Individual production and marketing strategies were maintained by the two companies. By neglecting the commodity category of the biscuit market, ABM’s domestic market share had declined to 15 percent. William Howard Palmer died in 1923 with an estate valued at £536,794. A factory was opened near Paris in 1923. At the time it was decried in Britain as the transfer of jobs overseas. 80 percent of the 6,000 strong workforce at the Reading factory went on strike in 1924. The dispute, regarding worker efficiency, was settled within three days after Huntley & Palmer agreed to recognise the worker’s union. Peek Frean turnover and profits had exceeded those of Huntley & Palmer by 1927. Peek Frean installed automated biscuit plants in the early 1930s, but H&P did not do so until 1938. ABM employed 7,245 people in 1935. Two large rivals emerged: the value biscuit manufacturer George Weston had established production volumes that equalled ABM by 1938. In 1948 the Scottish firms McVitie & Price and MacFarlane Lang merged to form United Biscuits, with 3,350 employees. Factories were opened in Canada, the United States and Australia in 1949. The Reading factory employed 3,000 people in 1954. A new factory was opened in Huyton, Liverpool in 1955. The Cornish Wafer was H&P’s highest selling biscuit by 1954. Associated Biscuits concentrated on cream, savoury and assorted biscuits. Around 15 to 20 percent of production was exported in 1959. Jacob’s, the third largest biscuit manufacturer in Britain, was acquired by ABM in 1960. ABM was reorganised as Associated Biscuits in 1969. AB employed 9,856 people in 1972. From 1972 the company dedicated the vast majority of its advertising spend to the Jacob’s brand. One third of sales came from overseas, with factories in Australia, Canada and India. Associated Biscuits had an 18 percent share of the British biscuit market in 1976. It was behind United Biscuits with 40 percent. The Reading factory was closed that year, and production was relocated to Liverpool. Overseas production was dedicated to British-style biscuits. Digestives and shortcakes were popular in Canada, whilst the Indian market preferred cream crackers and Thin Arrowroot. In 1982 Associated Biscuits employed over 14,000 people in Britain, and 3,100 overseas. Nabisco, the American manufacturer of Shredded Wheat and Ritz crackers, acquired Associated Biscuits in 1982. Nabisco was interested in the Huntley & Palmer brand, as well as its worldwide distribution network, particularly in Singapore, Canada, France and Germany. The five Associated Biscuits factories in Britain were operating at half to two thirds capacity, and the business became loss-making. The Huyton factory was closed with the loss of 770 jobs in 1984, and production was relocated to Aintree, Liverpool. 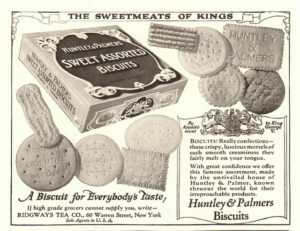 Huntley & Palmer was positioned as the Associated Biscuits premium sweet biscuit brand. However it accounted for just five percent of company production by weight by 1988. Nabisco did not successfully manage their British biscuit operations. Their market share in biscuits declined to 11.7 percent by 1988, and they were forced to reverse their decision to discontinue production of Bath Oliver biscuits following popular protest. The Peek Frean factory at Bermondsey was closed in 1989 with the loss of 1,022 jobs. The site was closed due to high overheads and traffic congestion. Production was transferred to Aintree and Leicestershire. Associated Biscuits was acquired by BSN of France in 1989. The Huntley & Palmer brand was phased out in favour of the Jacob’s name in 1990. It made sense to concentrate resources behind a single brand, and the Jacob’s name was better known, and believed to have a more contemporary image than the Huntley & Palmer brand. Huntley & Palmer products subjected to a re-branding included Romany and Crumbles. The head office was relocated from Reading to Liverpool in 1996. BSN (now called Danone) sold its UK and Irish biscuit operations to United Biscuits for £200 million in 2004. Former Huntley & Palmer products such as Lemon Puffs and Cornish Wafers are still sold under the Jacob’s brand, and Thin Arrowroots under the McVitie’s name. 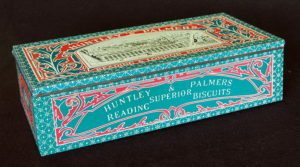 Huntley & Palmer biscuits are still produced in New Zealand. Since around 2018 the Huntley & Palmer brand in the United Kingdom appears to have been acquired by Freemans Confectionery, a Walsall-based confectionery wholesaler, who use the brand to market own-label products such as cakes. would love to hear from any of my colleagues from the old ABL sales force and also when we were taken over by Nabisco.